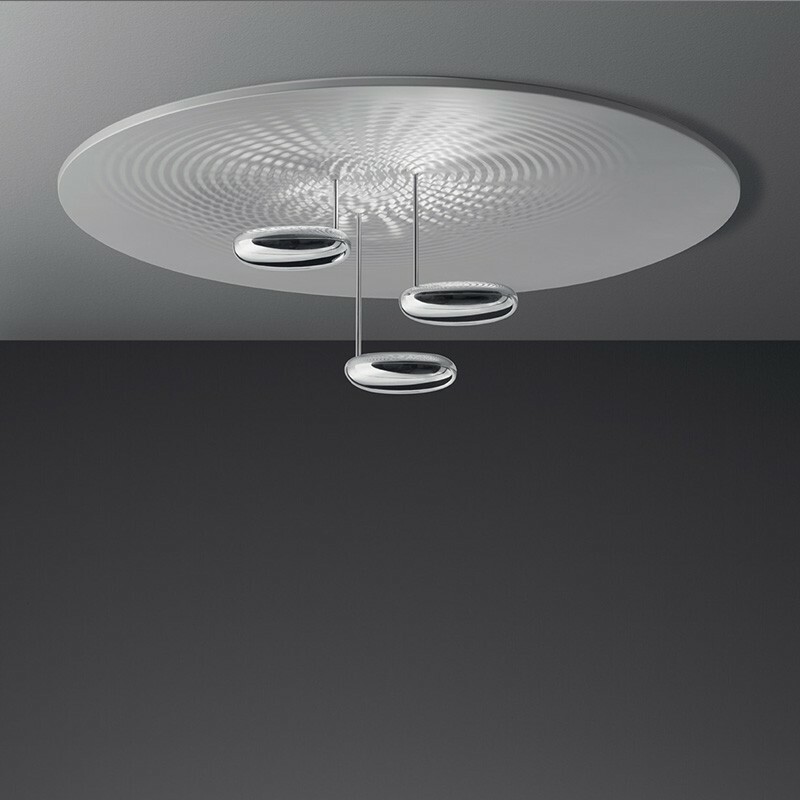 The Droplet soffitto ceiling lamp by renowned manufacturer Artemide is a fascinating illumination of the object, the light and light control in a metaphorical connection to the water releases. Three shapely luminous bodies appear namely, how eternally trapped dew drops, the float magically over a patterned aluminum surface which evokes a rippling waters. Perfect merge form and function, since the artful drops of light create, in conjunction with the round shield a magical, indirect light game. The halogen light of the three light-emitting body is reflected from the aluminum plate, and then reproduced in the room. But not only in the ON state, the Droplet soffitto an impressive highlight dar. If the light is off, the reflector that surrounds him light and the objects captures and reflects this resist, so the ceiling light is a perpetual Allure guarantor. The Artemide ceiling light from the pen by Ross Lovegrove is a natural theme, the water, in a modern context to imaginative. The play of light and reflection surface creates this unique moments that contribute significantly to the exclusive ambience of their habitat.